This article is about the French playwright. For other uses, see Molière (disambiguation). 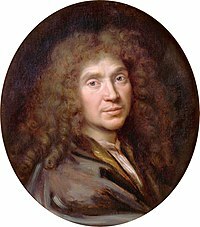 Jean-Baptiste Poquelin, known by his stage name Molière (/mɒlˈjɛər, moʊl-/; French: [mɔ.ljɛːʁ]; 15 January 1622 – 17 February 1673), was a French playwright, actor and poet, widely regarded as one of the greatest writers in the French language and universal literature. His extant works include comedies, farces, tragicomedies, comédie-ballets and more. His plays have been translated into every major living language and are performed at the Comédie-Française more often than those of any other playwright today. His influence is such that the French language itself is often referred to as the "language of Molière". 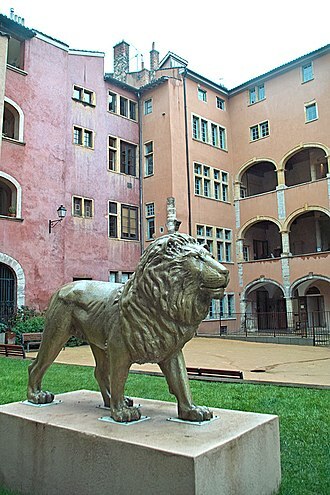 Born into a prosperous family and having studied at the Collège de Clermont (now Lycée Louis-le-Grand), Molière was well suited to begin a life in the theatre. Thirteen years as an itinerant actor helped him polish his comic abilities while he began writing, combining Commedia dell'arte elements with the more refined French comedy. 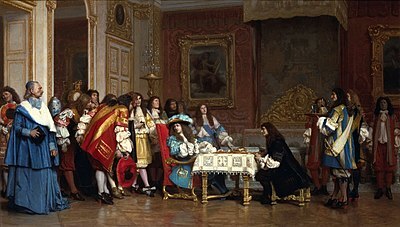 Through the patronage of aristocrats including Philippe I, Duke of Orléans—the brother of Louis XIV—Molière procured a command performance before the King at the Louvre. Performing a classic play by Pierre Corneille and a farce of his own, The Doctor in Love, Molière was granted the use of salle du Petit-Bourbon near the Louvre, a spacious room appointed for theatrical performances. Later, he was granted the use of the theatre in the Palais-Royal. 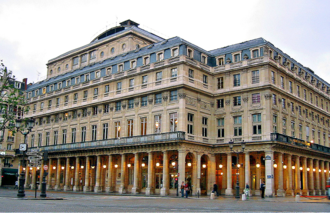 In both locations Molière found success among Parisians with plays such as The Affected Ladies, The School for Husbands and The School for Wives. This royal favour brought a royal pension to his troupe and the title Troupe du Roi ("The King's Troupe"). Molière continued as the official author of court entertainments. Despite the adulation of the court and Parisians, Molière's satires attracted criticism from churchmen. For Tartuffe's impiety, the Catholic Church denounced this study of religious hypocrisy followed by the Parliament's ban, while Don Juan was withdrawn and never restaged by Molière. His hard work in so many theatrical capacities took its toll on his health and, by 1667, he was forced to take a break from the stage. In 1673, during a production of his final play, The Imaginary Invalid, Molière, who suffered from pulmonary tuberculosis, was seized by a coughing fit and a haemorrhage while playing the hypochondriac Argan. He finished the performance but collapsed again and died a few hours later. Molière was born in Paris, the son of Jean Poquelin and Marie Cressé, the daughter of a prosperous bourgeois family. Upon seeing him for the first time, a maid exclaimed, "Le nez! ", a reference to the infant's large nose. Molière was called "Le Nez" by his family from that time. He lost his mother when he was ten and he does not seem to have been particularly close to his father. After his mother's death, he lived with his father above the Pavillon des Singes on the rue Saint-Honoré, an affluent area of Paris. It is likely that his education commenced with studies at a Parisian elementary school; followed by his enrolment in the prestigious Jesuit Collège de Clermont, where he completed his studies in a strict academic environment and got a first taste of life on the stage. In 1631, Jean Poquelin purchased from the court of Louis XIII the posts of "valet de chambre ordinaire et tapissier du Roi" ("valet of the King's chamber and keeper of carpets and upholstery"). His son assumed the same posts in 1641. The title required only three months' work and an initial cost of 1,200 livres; the title paid 300 livres a year and provided a number of lucrative contracts. Molière also studied as a provincial lawyer some time around 1642, probably in Orléans, but it is not documented that he ever qualified. So far he had followed his father's plans, which had served him well; he had mingled with nobility at the Collège de Clermont and seemed destined for a career in office. In June 1643, when Molière was 21, he decided to abandon his social class and pursue a career on the stage. Taking leave of his father, he joined the actress Madeleine Béjart, with whom he had crossed paths before, and founded the Illustre Théâtre with 630 livres. They were later joined by Madeleine's brother and sister. The new theatre troupe went bankrupt in 1645. Molière had become head of the troupe, due in part, perhaps, to his acting prowess and his legal training. However, the troupe had acquired large debts, mostly for the rent of the theatre (a court for jeu de paume), for which they owed 2000 livres. Historians differ as to whether his father or the lover of a member of his troupe paid his debts; either way, after a 24-hour stint in prison he returned to the acting circuit. It was at this time that he began to use the pseudonym Molière, possibly inspired by a small village of the same name in the Midi near Le Vigan. It was also likely that he changed his name to spare his father the shame of having an actor in the family (actors, although no longer vilified by the state under Louis XIV, were still not allowed to be buried in sacred ground). After his imprisonment, he and Madeleine began a theatrical circuit of the provinces with a new theatre troupe; this life was to last about twelve years, during which he initially played in the company of Charles Dufresne, and subsequently created a company of his own, which had sufficient success and obtained the patronage of Philippe I, Duke of Orléans. Few plays survive from this period. The most noteworthy are L'Étourdi ou les Contretemps (The Bungler) and Le Docteur Amoureux (The Doctor in Love); with these two plays, Molière moved away from the heavy influence of the Italian improvisational Commedia dell'arte, and displayed his talent for mockery. In the course of his travels he met Armand, Prince of Conti, the governor of Languedoc, who became his patron, and named his company after him. This friendship later ended when Armand, having contracted syphilis from a courtesan, turned towards religion and joined Molière's enemies in the Parti des Dévots and the Compagnie de Saint Sacrement. In Lyon, Mademoiselle Du Parc, known as Marquise, joined the company. Marquise was courted, in vain, by Pierre Corneille and later became the lover of Jean Racine. Racine offered Molière his tragedy Théagène et Chariclée (one of the first works he wrote after he had abandoned his theology studies), but Molière would not perform it, though he encouraged Racine to pursue his artistic career. It is said that soon thereafter Molière became angry with Racine when he was told that he had secretly presented his tragedy to the company of the Hôtel de Bourgogne as well. Molière was forced to reach Paris in stages, staying outside for a few weeks in order to promote himself with society gentlemen and allow his reputation to feed in to Paris. Molière reached Paris in 1658 and performed in front of the King at the Louvre (then for rent as a theatre) in Corneille's tragedy Nicomède and in the farce Le Docteur Amoureux with some success. He was awarded the title of Troupe de Monsieur (Monsieur being the honorific for the king's brother Philippe I, Duke of Orléans). With the help of Monsieur, his company was allowed to share the theatre in the large hall of the Petit-Bourbon with the famous Italian Commedia dell'arte company of Tiberio Fiorillo, famous for his character of Scaramouche. (The two companies performed in the theatre on different nights.) 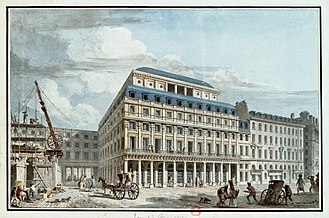 The premiere of Molière's Les Précieuses Ridicules (The Affected Young Ladies) took place at the Petit-Bourbon on 18 November 1659. Les Précieuses Ridicules was the first of Molière's many attempts to satirize certain societal mannerisms and affectations then common in France. It is widely accepted that the plot was based on Samuel Chappuzeau's Le Cercle des Femmes of 1656. He primarily mocks the Académie Française, a group created by Richelieu under a royal patent to establish the rules of the fledgling French theatre. The Académie preached unity of time, action, and styles of verse. Molière is often associated with the claim that comedy castigat ridendo mores or "criticises customs through humour" (a phrase in fact coined by his contemporary Jean de Santeuil and sometimes mistaken for a classical Latin proverb). Despite his own preference for tragedy, which he had tried to further with the Illustre Théâtre, Molière became famous for his farces, which were generally in one act and performed after the tragedy. Some of these farces were only partly written, and were played in the style of Commedia dell'arte with improvisation over a canovaccio (a vague plot outline). He also wrote two comedies in verse, but these were less successful and are generally considered less significant. Later in life Molière concentrated on writing musical comedies, in which the drama is interrupted by songs and/or dances. Les Précieuses Ridicules won Molière the attention and the criticism of many, but it was not a popular success. He then asked Fiorillo to teach him the techniques of Commedia dell'arte. His 1660 play Sganarelle, ou Le Cocu imaginaire (The Imaginary Cuckold) seems to be a tribute both to Commedia dell'arte and to his teacher. Its theme of marital relationships dramatizes Molière's pessimistic views on the falsity inherent in human relationships. This view is also evident in his later works and was a source of inspiration for many later authors, including (in a different field and with different effect) Luigi Pirandello. It describes a kind of round dance where two couples believe that each of their partners has been betrayed by the other's and is the first in Molière's "Jealousy series", which includes Dom Garcie de Navarre, L'École des maris and L'École des femmes. First volume of a 1739 translation into English of all of Molière's plays, printed by John Watts. 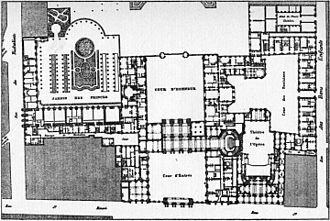 In 1660 the Petit-Bourbon was demolished to make way for the eastern expansion of the Louvre, but Molière's company was allowed to move into the abandoned theatre in the east wing of the Palais-Royal. After a period of refurbishment they opened there on 20 January 1661. 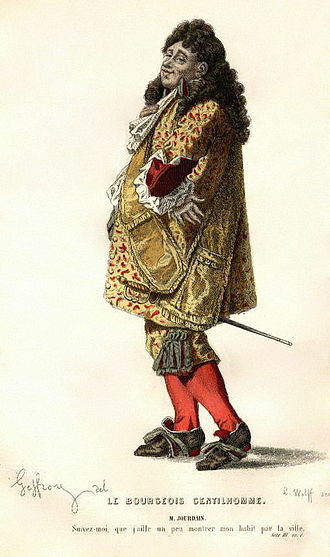 In order to please his patron, Monsieur, who was so enthralled with entertainment and art that he was soon excluded from state affairs, Molière wrote and played Dom Garcie de Navarre ou Le Prince jaloux (The Jealous Prince, 4 February 1661), a heroic comedy derived from a work of Cicognini's. Two other comedies of the same year were the successful L'École des maris (The School for Husbands) and Les Fâcheux, subtitled Comédie faite pour les divertissements du Roi (a comedy for the King's amusements) because it was performed during a series of parties that Nicolas Fouquet gave in honor of the sovereign. These entertainments led Jean-Baptiste Colbert to demand the arrest of Fouquet for wasting public money, and he was condemned to life imprisonment. On 20 February 1662 Molière married Armande Béjart, whom he believed to be the sister of Madeleine. (She may instead have been her illegitimate daughter with the Duke of Modena.) The same year he premiered L'École des femmes (The School for Wives), subsequently regarded as a masterpiece. It poked fun at the limited education that was given to daughters of rich families and reflected Molière's own marriage. Both this work and his marriage attracted much criticism. The play sparked the protest called the "Quarrel of L'École des femmes". On the artistic side he responded with two lesser-known works: La Critique de "L'École des femmes", in which he imagined the spectators of his previous work attending it. The piece mocks the people who had criticised L'École des femmes by showing them at dinner after watching the play; it addresses all the criticism raised about the piece by presenting the critics' arguments and then dismissing them. This was the so-called Guerre comique (War of Comedy), in which the opposite side was taken by writers like Donneau de Visé, Edmé Boursault, and Montfleury. But more serious opposition was brewing, focusing on Molière's politics and his personal life. A so-called parti des Dévots arose in French high society, who protested against Molière's excessive "realism" and irreverence, which were causing some embarrassment. These people accused Molière of having married his daughter. The Prince of Conti, once Molière's friend, joined them. Molière had other enemies, too, among them the Jansenists and some traditional authors. However, the king expressed support for the author, granting him a pension and agreeing to be the godfather of Molière's first son. Boileau also supported him through statements that he included in his Art poétique. Molière's friendship with Jean-Baptiste Lully influenced him towards writing his Le Mariage forcé and La Princesse d'Élide (subtitled as Comédie galante mêlée de musique et d'entrées de ballet), written for royal "divertissements" at the Palace of Versailles. Tartuffe, ou L'Imposteur was also performed at Versailles, in 1664, and created the greatest scandal of Molière's artistic career. Its depiction of the hypocrisy of the dominant classes was taken as an outrage and violently contested. It also aroused the wrath of the Jansenists and the play was banned. Molière was always careful not to attack the institution of monarchy. He earned a position as one of the king's favourites and enjoyed his protection from the attacks of the court. The king allegedly suggested that Molière suspend performances of Tartuffe, and the author rapidly wrote Dom Juan ou le Festin de Pierre to replace it. It was a strange work, derived from a work by Tirso de Molina and rendered in a prose that still seems modern today. It describes the story of an atheist who becomes a religious hypocrite and for this is punished by God. This work too was quickly suspended. The king, demonstrating his protection once again, became the new official sponsor of Molière's troupe. With music by Lully, Molière presented L'Amour médecin (Love Doctor or Medical Love). Subtitles on this occasion reported that the work was given "par ordre du Roi" (by order of the king) and this work was received much more warmly than its predecessors. In 1666, Le Misanthrope was produced. It is now widely regarded as Molière's most refined masterpiece, the one with the highest moral content, but it was little appreciated at its time. It caused the "conversion" of Donneau de Visé, who became fond of his theatre. But it was a commercial flop, forcing Molière to immediately write Le médecin malgré lui (The Doctor Despite Himself), a satire against the official sciences. This was a success despite a moral treatise by the Prince of Conti, criticizing the theatre in general and Molière in particular. In several of his plays, Molière depicted the physicians of his day as pompous individuals who speak (poor) Latin to impress others with false erudition, and know only clysters and bleedings as (ineffective) remedies. After the Mélicerte and the Pastorale comique, he tried again to perform a revised Tartuffe in 1667, this time with the name of Panulphe or L'Imposteur. As soon as the King left Paris for a tour, Lamoignon and the archbishop banned the play. The King finally imposed respect for Tartuffe a few years later, after he had gained more power over the clergy. Molière, now ill, wrote less. 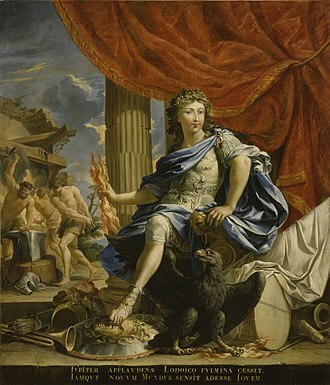 Le Sicilien ou L'Amour peintre was written for festivities at the castle of Saint-Germain-en-Laye, and was followed in 1668 by Amphitryon, inspired both by Plautus' work of the same name and Jean Rotrou's successful reconfiguration of the drama. With some conjecture, Molière's play can be seen to allude to the love affairs of Louis XIV, then king of France. George Dandin, ou Le mari confondu (The Confounded Husband) was little appreciated, but success returned with L'Avare (The Miser), now very well known. With Lully he again used music for Monsieur de Pourceaugnac, for Les Amants magnifiques, and finally for Le Bourgeois gentilhomme (The Middle Class Gentleman), another of his masterpieces. It is claimed to be particularly directed against Colbert, the minister who had condemned his old patron Fouquet. The collaboration with Lully ended with a tragédie et ballet, Psyché, written in collaboration with Pierre Corneille and Philippe Quinault. In 1672, Madeleine Béjart died, and Molière suffered from this loss and from the worsening of his own illness. Nevertheless, he wrote a successful Les Fourberies de Scapin ("Scapin's Deceits"), a farce and a comedy in five acts. His following play, La Comtesse d'Escarbagnas, is considered one of his lesser works. Les Femmes savantes (The Learned Ladies) of 1672 is considered another of Molière's masterpieces. It was born from the termination of the legal use of music in theatre, since Lully had patented the opera in France (and taken most of the best available singers for his own performances), so Molière had to go back to his traditional genre. It was a great success, and it led to his last work (see below), which is still held in high esteem. In his 14 years in Paris, Molière singlehandedly wrote 31 of the 85 plays performed on his stage. In 1661, Molière introduced the comédies-ballets in conjunction with Les Fâcheux. These ballets were a transitional form of dance performance between the court ballets of Louis XIV and the art of professional theatre which was developing in the advent of the use of the proscenium stage. The comédies-ballets developed accidentally when Molière was enlisted to mount both a play and a ballet in the honor of Louis XIV and found that he did not have a big enough cast to meet these demands. Molière therefore decided to combine the ballet and the play so that his goal could be met while the performers catch their breath and change costume. The risky move paid off and Molière was asked to produce twelve more comédies-ballets before his death. During the comédies-ballets, Molière collaborated with Pierre Beauchamp. Beauchamp codified the five balletic positions of the feet and arms and was partly responsible for the creation of the Beauchamp-Feuillet dance notation. Molière also collaborated with Jean-Baptiste Lully. Lully was a dancer, choreographer, and composer, whose dominant reign at the Paris Opéra lasted fifteen years. Under his command, ballet and opera rightly became professional arts unto themselves. The comédies-ballets closely integrated dance with music and the action of the play and the style of continuity distinctly separated these performances from the court ballets of the time; additionally, the comédies-ballets demanded that both the dancers and the actors play an important role in advancing the story. Similar to the court ballets, both professionally trained dancers and courtiers socialized together at the comédies-ballets - Louis XIV even played the part of an Egyptian in Molière's Le Mariage forcé (1664) and also appeared as Neptune and Apollo in his retirement performance of Les Amants magnifiques (1670). Molière's tomb at the Père Lachaise Cemetery. La Fontaine's is visible just beyond. Molière suffered from pulmonary tuberculosis, possibly contracted when he was imprisoned for debt as a young man. One of the most famous moments in Molière's life was his last, which became legend: he collapsed on stage in a fit of coughing and haemorrhaging while performing in the last play he had written, which had lavish ballets performed to the music of Marc-Antoine Charpentier and which ironically was entitled Le Malade imaginaire (The Imaginary Invalid). Molière insisted on completing his performance. Afterwards he collapsed again with another, larger haemorrhage before being taken home, where he died a few hours later, without receiving the last rites because two priests refused to visit him while a third arrived too late. The superstition that green brings bad luck to actors is said to originate from the colour of the clothing he was wearing at the time of his death. Under French law at the time, actors were not allowed to be buried in the sacred ground of a cemetery. However, Molière's widow, Armande, asked the King if her spouse could be granted a normal funeral at night. The King agreed and Molière's body was buried in the part of the cemetery reserved for unbaptised infants. In 1792 his remains were brought to the museum of French monuments and in 1817 transferred to Père Lachaise Cemetery in Paris, close to those of La Fontaine. Though conventional thinkers, religious leaders and medical professionals in Molière's time criticised his work, their ideas did not really diminish his widespread success with the public. Other playwrights and companies began to emulate his dramatic style in England and in France. Molière's works continued to garner positive feedback in 18th-century England, but they were not so warmly welcomed in France at this time. However, during the French Restoration of the 19th century, Molière's comedies became popular with both the French public and the critics. Romanticists admired his plays for the unconventional individualism they portrayed. 20th-century scholars have carried on this interest in Molière and his plays and have continued to study a wide array of issues relating to this playwright. 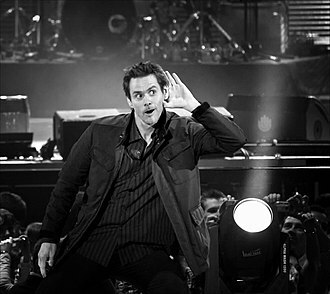 Many critics now are shifting their attention from the philosophical, religious and moral implications in his comedies to the more objective study of his comic technique. 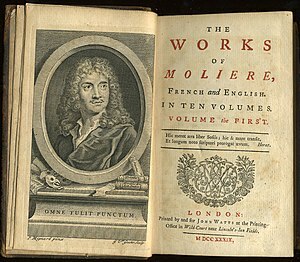 Molière's works were translated into English prose by John Ozell in 1714, but the first complete version in English, by Baker and Miller in 1739, remained "influential" and was long reprinted. The first to offer full translations of Molière's verse plays such as Tartuffe into English verse was Curtis Hidden Page, who produced blank verse versions of three of the plays in his 1908 translation. Since then, notable translations have been made by Richard Wilbur, Donald M. Frame, and many others. In his memoir A Terrible Liar, actor Hume Cronyn writes that, in 1962, celebrated actor Laurence Olivier criticized Molière in a conversation with him. According to Cronyn, he mentioned to Olivier that he (Cronyn) was about to play the title role in The Miser, and that Olivier then responded, "Molière? Funny as a baby's open grave." Cronyn comments on the incident: "You may imagine how that made me feel. Fortunately, he was dead wrong." [Molière] has been accused of not having a consistent, organic style, of using faulty grammar, of mixing his metaphors, and of using unnecessary words for the purpose of filling out his lines. All these things are occasionally true, but they are trifles in comparison to the wealth of character he portrayed, to his brilliancy of wit, and to the resourcefulness of his technique. He was wary of sensibility or pathos; but in place of pathos he had "melancholy — a puissant and searching melancholy, which strangely sustains his inexhaustible mirth and his triumphant gaiety". A tartuffe is a hypocrite, especially a hypocrite displaying affected morality or religious piety. 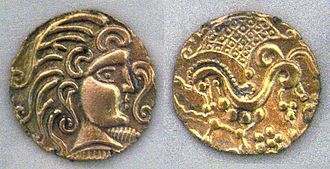 A harpagon, named after the main character of The Miser, is an obsessively greedy and cheap man. The statue of the Commander (statue du Commandeur) from Don Juan is used as a model of implacable rigidity (raide comme la statue du Commandeur). In Les Fourberies de Scapin, Act II, scene 7, Géronte is asked for ransom money for his son, allegedly held in a galley. He repeats, "What the deuce did he want to go into that galley for?" ("Que diable allait-il faire dans cette galère?") The phrase "to go into that galley" is used to describe unnecessary difficulties a person has sought. Note that a punishment in 16th and 17th century France was condemnation to life as a galley slave. In Le médecin malgré lui, forced to impersonate a doctor, the chancer Sganarelle examines a young woman who is faking muteness in order to delay an arranged marriage. He then delivers to her father a "diagnosis" which consists of strings of jibberish, dog latin and recursive explanations which conclude with an authoritative "and so that is why your daughter is mute" ("Et voilà pourquoi votre fille est muette"). The phrase is used wholesale to mock an unsatisfactory explanation. 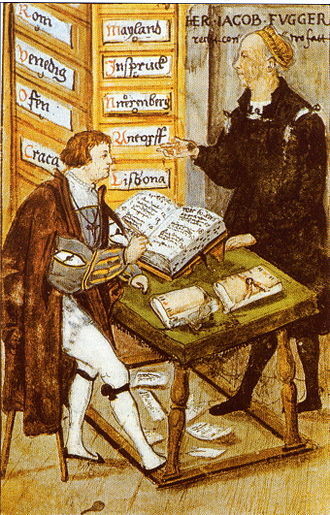 Monsieur Jourdain in Le Bourgeois Gentilhomme arranges to be tutored in good manners and culture, and is delighted to learn that, because every statement that is not poetry is prose, he therefore has been speaking prose for 40 years without knowing it ("Par ma foi, il y a plus de quarante ans que je dis de la prose, sans que j’en susse rien"). The more modern phrase "je parle de la prose sans le savoir" is used by a person who realizes that he was more skilled or better aligned than he thought. Molière plays a small part in Alexandre Dumas's novel The Vicomte of Bragelonne, in which he is seen taking inspiration from the muskeeter Porthos for his central character in Le Bourgeois Gentilhomme. Russian writer Mikhail Bulgakov wrote a semi-fictitious biography-tribute to Molière, titled Life of Mr. de Molière. Written 1932–1933, first published 1962. The French 1978 film simply titled Molière directed by Ariane Mnouchkine and starring Philippe Caubère presents his complete biography. It was in competition for the Palme d'Or at Cannes in 1978. He is portrayed among other writers in The Blasphemers' Banquet (1989). The 2000 film Le Roi Danse (The King Dances), in which Molière is played by Tchéky Karyo, shows his collaborations with Jean-Baptiste Lully, as well as his illness and on-stage death. The 2007 French film Molière was more loosely based on the life of Molière, starring Romain Duris, Fabrice Luchini and Ludivine Sagnier. ^ "Molière". Random House Webster's Unabridged Dictionary. ^ Hartnoll, p. 554. "Author of some of the finest comedies in the history of the theater", and Roy, p. 756. "...one of the theatre's greatest comic artists". ^ Randall, Colin (24 October 2004). "France looks to the law to save the language of Molière" – via www.telegraph.co.uk. ^ "Who Speaks the Language of Moliere?". www.americanthinker.com. ^ a b Roy, p. 756–757. ^ Shelley, Mary Wollstonecraft (1840). Lives of the Most Eminent French Writers. Philadelphia: Lea and Blanchard. p. 116. ^ Brockett, Oscar (2008). History of the Theatre. USA: Pearson. p. 199. ISBN 978-0-205-51186-0. ^ O'Malley, John W. (2014). 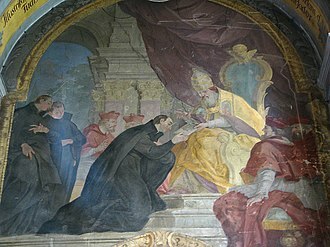 The Jesuits; a history from Ignatius to the present. London: Sheed and Ward. p. 30. ^ Alfred Simon, Molière, une vie (Lyon: La Manufacture, 1988), pp. 520-21. ^ Martin Barnham. "The Cambridge Guide to Theater." Cambridge Univ. Pr., 1995, p. 472. ^ a b c d e Au, Susan (2002). Ballet and Modern Dance - Second Edition. London: Thames & Hudson LTD. p. 23. ISBN 978-0-500-20352-1. ^ Au, Susan (2002). Ballet and Modern Dance - Second Edition. London: Thames & Hudson LTD. p. 26. ISBN 978-0-500-20352-1. ^ Au, Susan (2002). Ballet and Modern Dance - Second Edition. London: Thames & Hudson LTD. p. 25. ISBN 978-0-500-20352-1. ^ a b Au, Susan (2002). Ballet and Modern Dance - Second Edition. London: Thames & Hudson LTD. p. 24. ISBN 978-0-500-20352-1. ^ ""Molière: Introduction" ''Drama Criticism''. Vol. 13. Ed. Linda Pavlovski. Gale Group, Inc., 2001. Accessed: 28 Nov, 2007". Enotes.com. Retrieved 2010-03-09. ^ "Bibliography" in Curtis Hidden Page, trans., French Classics for English Readers: Molière New York & London, G.P. Putnam's Sons, 1908, Vol. 1, p. xliii. Retrieved 2010-06-27. ^ Olive Classe, ed., Encyclopedia of literary translation into English: M-Z, Volume 2 London: Fitzroy Dearborn Publishers, 2000, Vol. 2, p. 958. Retrieved 2010-06-27. ^ "Preface to the Translation" in Curtis Hidden Page, trans., French Classics for English Readers: Molière New York & London, G.P. Putnam's Sons, 1908, Vol. 1, p. xxxi. Retrieved 2010-06-27. ^ Hume Cronyn, A Terrible Liar: A Memoir, New York: Morrow, 1991, p. 275. Accessed via Google Books on 1 Nov. 2009. Retrieved 2010-03-09. ^ "Bellinger, Martha Fletcher (1927) ''A Short History of the Drama'' New York: Henry Holt & Company. pp. 178-81. Accessed: Nov 27, 2007". Theatredatabase.com. Retrieved 2010-03-09. ^ "The Imaginary Invalid". The Encyclopaedia Britannica. Retrieved 25 February 2019. 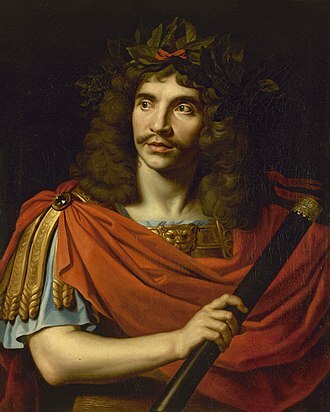 Wikimedia Commons has media related to Molière. "Biography, Bibliography, Analysis, Plot overview" (in French). biblioweb.org. Archived from the original on 2006-01-14. "Bring a Torch, Jeanette, Isabella"
Louis XIV, known as Louis the Great or the Sun King, was a monarch of the House of Bourbon who ruled as King of France and Navarre from 1643 until his death in 1715. His reign of 72 years and 110 days is the longest of any monarch of a country in European history. In the age of absolutism in Europe, Louis XIVs France was a leader in the centralization of power. 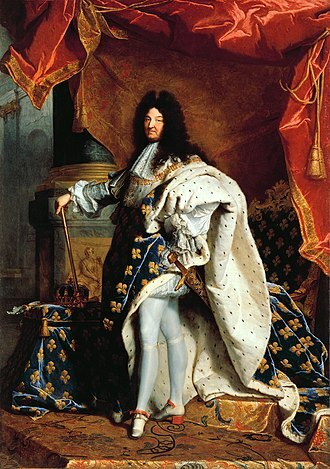 Louis began his rule of France in 1661, after the death of his chief minister. By these means he became one of the most powerful French monarchs, under his rule, the Edict of Nantes, which granted rights to Huguenots, was abolished. 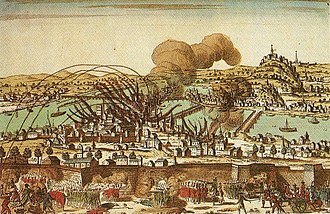 The revocation effectively forced Huguenots to emigrate or convert in a wave of dragonnades, which managed to virtually destroy the French Protestant minority. During Louis reign, France was the leading European power, and it fought three wars, the Franco-Dutch War, the War of the League of Augsburg. There were two lesser conflicts, the War of Devolution and the War of the Reunions, warfare defined Louis XIVs foreign policies, and his personality shaped his approach. Impelled by a mix of commerce and pique, in peacetime he concentrated on preparing for the next war. He taught his diplomats their job was to create tactical and strategic advantages for the French military, Louis XIV was born on 5 September 1638 in the Château de Saint-Germain-en-Laye, to Louis XIII and Anne of Austria. He was named Louis Dieudonné and bore the title of French heirs apparent. At the time of his birth, his parents had married for 23 years. 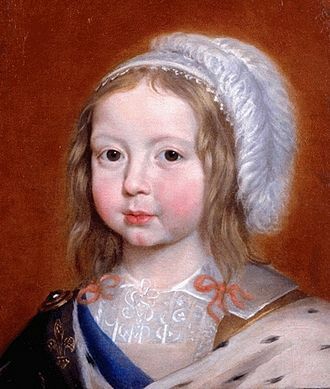 His mother had experienced four stillbirths between 1619 and 1631, leading contemporaries thus regarded him as a divine gift and his birth a miracle of God. Sensing imminent death, Louis XIII decided to put his affairs in order in the spring of 1643, in defiance of custom, which would have made Queen Anne the sole Regent of France, the king decreed that a regency council would rule on his sons behalf. His lack of faith in Queen Annes political abilities was his primary rationale and he did, make the concession of appointing her head of the council. Jean Racine, baptismal name Jean-Baptiste Racine, was a French dramatist, one of the three great playwrights of 17th-century France, and an important literary figure in the Western tradition. The latest attempt to translate Racines plays into English earned a 2011 American Book Award for the poet Geoffrey Argent, Racines dramaturgy is marked by his psychological insight, the prevailing passion of his characters, and the nakedness of both the plot and stage. Racine was born on 22 December 1639 in La Ferté-Milon, in the province of Picardy in northern France, orphaned by the age of four, he came into the care of his grandparents. At the death of his grandfather in 1649, his grandmother, Marie des Moulins, went to live in the convent of Port-Royal and he received a classical education at the Petites écoles de Port-Royal, a religious institution which would greatly influence other contemporary figures including Blaise Pascal. Port-Royal was run by followers of Jansenism, a theology condemned as heretical by the French bishops, Racines interactions with the Jansenists in his years at this academy would have great influence over him for the rest of his life. At Port-Royal, he excelled in his studies of the Classics and he was expected to study law at the Collège dHarcourt in Paris, but instead found himself drawn to a more artistic lifestyle. Racine eventually took up residence in Paris where he involved in theatrical circles. His first play, never reached the stage, on 20 June 1664, Racines tragedy La Thébaïde ou les frères ennemis was produced by Molières troupe at the Théâtre du Palais-Royal, in Paris. The following year, Molière put on Racines second play, Alexandre premiered for the second time, by a different acting troupe, eleven days after its first showing. From this point on the Hôtel de Bourgogne troupe performed all of Racines secular plays and he broke all ties with Port-Royal, and proceeded with Andromaque, which told the story of Andromache, widow of Hector, and her fate following the Trojan War. Amongst his rivals were Pierre Corneille and his brother, Thomas Corneille, tragedians often competed with alternative versions of the same plot, for example, Michel le Clerc produced an Iphigénie in the same year as Racine, and Jacques Pradon wrote a play about Phèdre. Dom Juan or The Feast with the Statue is a French play, a comedy in five acts, written by Molière, and based on the legend of Don Juan. The title of Molière’s play is commonly expressed as Don Juan. Dom Juan is the last part in Molières hypocrisy trilogy, which includes The School for Wives and it was first performed on 15 February 1665 in the Théâtre du Palais-Royal, with Molière playing the role of Sganarelle. The play was a costly failure, as a result, Molière was ordered to delete a certain number of scenes and lines which, according to his censors, made a mockery of their faith. The play was published in a censored version for the first time in 1682. It was part of an edition, edited by La Grange and Vivot. The parts of Dom Juan that offended the censors were pasted over with strips of paper glued into almost all of the copies and this version was in prose, instead of the censored version by Thomas Corneille which Corneille had versified. Nearly a century and a later, in 1813, a full. 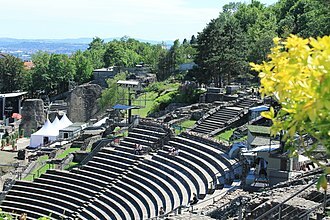 And in 1847 the play was added to the repertoire of the Comédie-Française, in the twentieth century the play is performed often and has garnered great critical attention and admiration. An uncensored version appeared in Amsterdam in 1683, Molière drew his inspiration from the main character of a work by Tirso de Molina called El burlador de Sevilla y convidado de piedra. However, the characters from the two differ in several aspects. However, his death comes sooner than expected and he finds that his attempts to repent, in both plays the main character is condemned to Hell. The story of this follows the last two days in the life of a young courtier, Dom Juan Tenorio, a libertine, a seducer of women. He is accompanied throughout the play by his valet, the unrepentant Don Juan will not escape the vengeance of Heaven, and he is ultimately punished. The various settings are all in Sicily, in the garden of the palace, after a few words of appreciation for snuff tobacco, Sganarelle speaks with Gusman, who is the squire to Donna Elvire. Her primary concern is the departure of her new husband. Sganarelle, not without pride, paints for Gusman a terrible portrait of Don Juan as a fickle, disbeliever, Donna Elvire enters to challenge him to explain the reasons for his departure. In a modern sense, comedy refers to any discourse or work generally intended to be humorous or amusing by inducing laughter, especially in theatre, television and stand-up comedy. The origins of the term are found in Ancient Greece, in the Athenian democracy, the public opinion of voters was influenced by the political satire performed by the comic poets at the theaters. The theatrical genre of Greek comedy can be described as a performance which pits two groups or societies against each other in an amusing agon or conflict. Northrop Frye depicted these two opposing sides as a Society of Youth and a Society of the Old, a revised view characterizes the essential agon of comedy as a struggle between a relatively powerless youth and the societal conventions that pose obstacles to his hopes. Satire and political satire use comedy to portray persons or social institutions as ridiculous or corrupt, parody subverts popular genres and forms, critiquing those forms without necessarily condemning them. 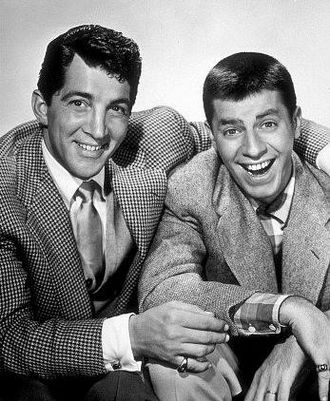 Similarly scatological humour, sexual humour, and race humour create comedy by violating social conventions or taboos in comic ways, a comedy of manners typically takes as its subject a particular part of society and uses humor to parody or satirize the behaviour and mannerisms of its members. Romantic comedy is a genre that depicts burgeoning romance in humorous terms. The adjective comic, which means that which relates to comedy is, in modern usage. Of this, the word came into usage through the Latin comoedia and Italian commedia and has, over time. The Greeks and Romans confined their use of the comedy to descriptions of stage-plays with happy endings. Aristotle defined comedy as an imitation of men worse than the average, the characters portrayed in comedies were not worse than average in every way, only insofar as they are Ridiculous, which is a species of the Ugly. The Ridiculous may be defined as a mistake or deformity not productive of pain or harm to others, the mask, for instance, in the Middle Ages, the term expanded to include narrative poems with happy endings. Commedia dellarte translates to theatre of the professional and is known as the first form of professional theatre. Commedia dellarte is considered commedia alla maschera, commedia improvviso, a commedia, such as The Tooth Puller, is both scripted and improvised. Characters entrances and exits are scripted, a special characteristic of commedia dellarte are the lazzi. A lazzo is a joke or something foolish or witty, another characteristic of commedia dellarte is pantomime, which is mostly used by the character Arlecchino. The characters of the commedia usually represent fixed social types, stock characters, such as old men, devious servants. The main categories of characters include servants, old men, lovers. The characters are exaggerated real characters, such as a know it all doctor called Il Dottore, many troupes were formed to perform commedia dellarte, including I Gelosi, Confidenti Troupe, Desioi Troupe, and Fedeli Troupe. Commedia dellarte was often performed outside on platforms or in areas such as a piazza. The form of theatre originated in Italy, but travelled throughout Europe, the commedia genesis may be related to carnival in Venice, where by 1570 the author/actor Andrea Calmo had created the character Il Magnifico, the precursor to the vecchio Pantalone. In the Flaminio Scala scenario for example, Il Magnifico persists and is interchangeable with Pantalone, while Calmos characters were not masked, it is uncertain at what point the characters donned the mask. However, the connection to carnival would suggest that masking was a convention of carnival and was applied at some point, the tradition in Northern Italy is centered in Mantua and Venice, where the major companies came under the aegis of the various dukes. Concomitantly, a Neapolitan tradition emerged in the south and featured the prominent stage figure Pulcinella, Pulcinella has been long associated with Naples, and derived into various types elsewhere—the most famous as the puppet character Punch in England. Although commedia dellarte flourished in Italy during the Mannerist period, there has been a tradition of trying to establish historical antecedents in antiquity. Theology is the critical study of the nature of the divine. It is taught as a discipline, typically in universities, seminaries. Augustine of Hippo defined the Latin equivalent, theologia, as reasoning or discussion concerning the Deity, the term can, however, be used for a variety of different disciplines or fields of study. Theologians use various forms of analysis and argument to help understand, test, the English equivalent theology had evolved by 1362. 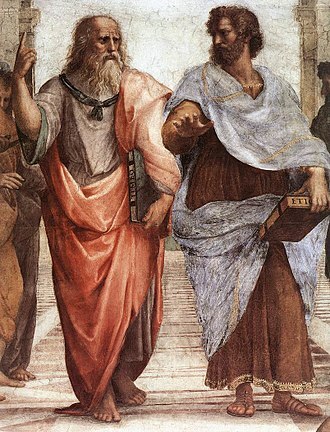 Greek theologia was used with the discourse on god in the fourth century BC by Plato in The Republic, Book ii. Drawing on Greek Stoic sources, the Latin writer Varro distinguished three forms of discourse, mythical and civil. Theologos, closely related to theologia, appears once in some manuscripts, in the heading to the book of Revelation, apokalypsis ioannoy toy theologoy. The Latin author Boethius, writing in the early 6th century, used theologia to denote a subdivision of philosophy as a subject of study, dealing with the motionless. Boethius definition influenced medieval Latin usage, Theology can now be used in a derived sense to mean a system of theoretical principles, an ideology. They suggest the term is appropriate in religious contexts that are organized differently. Kalam. does not hold the place in Muslim thought that theology does in Christianity. To find an equivalent for theology in the Christian sense it is necessary to have recourse to several disciplines, and to the usul al-fiqh as much as to kalam. Jose Ignacio Cabezon, who argues that the use of theology is appropriate, can only do so, he says, I take theology not to be restricted to its etymological meaning. In that latter sense, Buddhism is of course atheological, rejecting as it does the notion of God, within Hindu philosophy, there is a solid and ancient tradition of philosophical speculation on the nature of the universe, of God and of the Atman. The Sanskrit word for the schools of Hindu philosophy is Darshana. Nevertheless, Jewish theology historically has been active and highly significant for Christian. It is sometimes claimed, that the Jewish analogue of Christian theological discussion would more properly be Rabbinical discussion of Jewish law, the history of the study of theology in institutions of higher education is as old as the history of such institutions themselves. Iconic corner, entry to the Salle Richelieu, 2009. Philippe while Duke of Anjou, after Jean Nocret. Philippe holding a medallion of his favourite daughter Marie Louise, c.1670, Pierre Mignard. Home of the Corneille family in Rouen, where Corneille was born. It was turned into a museum dedicated to his work in 1920. View of the Palais-Royal in 1679. The theatre was in the east wing (on the right). 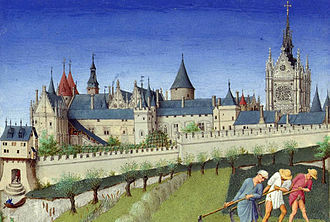 Orléans in September 1428, the time of the Siege of Orléans. 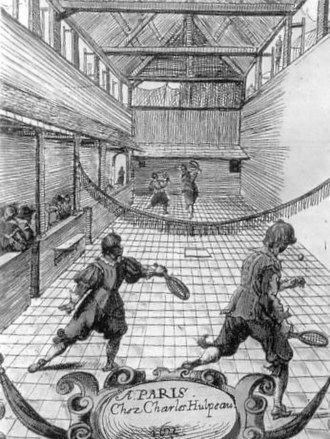 Late 18th-century illustration of jeu de paume paddle-bats or battoirs, and (in various stages of construction) strung racquets. A modernised court in the Palace of Fontainebleau, Fontainebleau (1991). Saint-Sernin Basilica in Toulouse, displaying the typical pink brick architecture of Upper Languedoc. The first completed Airbus A380 at the "A380 Reveal" event on 18 January 2005 in Toulouse, home base of the European aerospace industry. Frontispiece and titlepage of Tartuffe or The Imposter from a 1739 collected edition of his works in French and English, printed by John Watts. 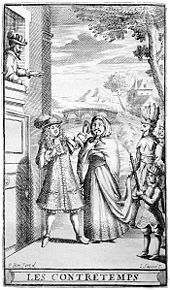 The engraving depicts the amoral Tartuffe being deceitfully seduced by Elmire, the wife of his host, Orgon who hides under a table. Henri Dupuy de Lôme lived 374 rue Saint-Honoré from 1857 until his death in 1885. Madeleine Béjart in Les précieuses ridicules. 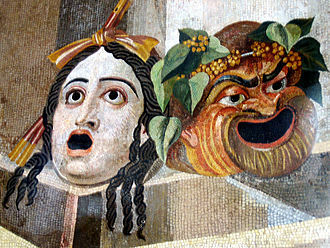 Tragic Comic masks of Ancient Greek theatre represented in the Hadrian's Villa mosaic. MASCARILLE : What do you think of my little goose? Do you find it goes with my outfit? CATHOS : Absolutely. (from Les Précieuses ridicules) Drawing by Moreau le Jeune.